This 1970s inspired introvert shirt is perfect for anyone who prefers their alone time. 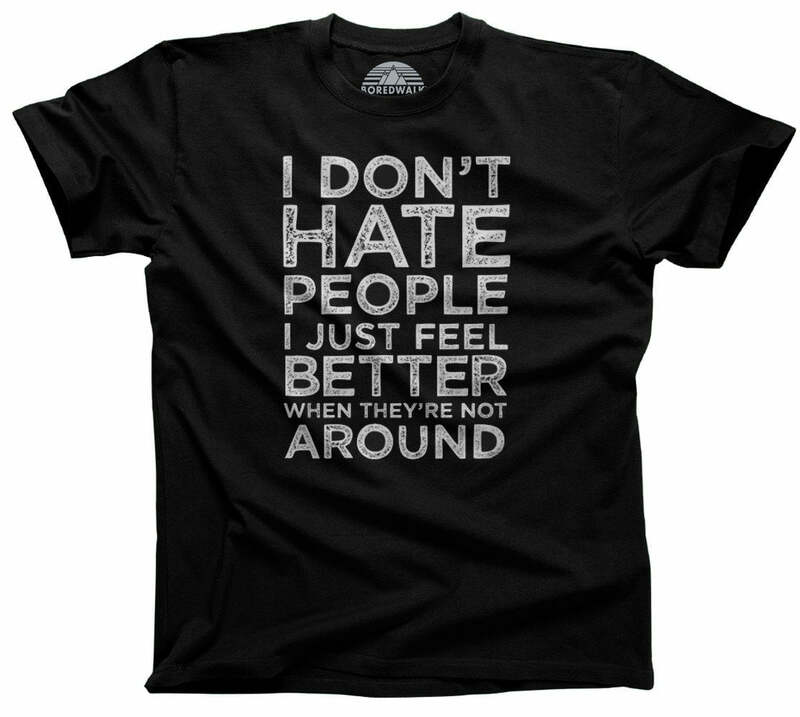 Say "I hate people" in 70s retro style with this funny misanthrope shirt. 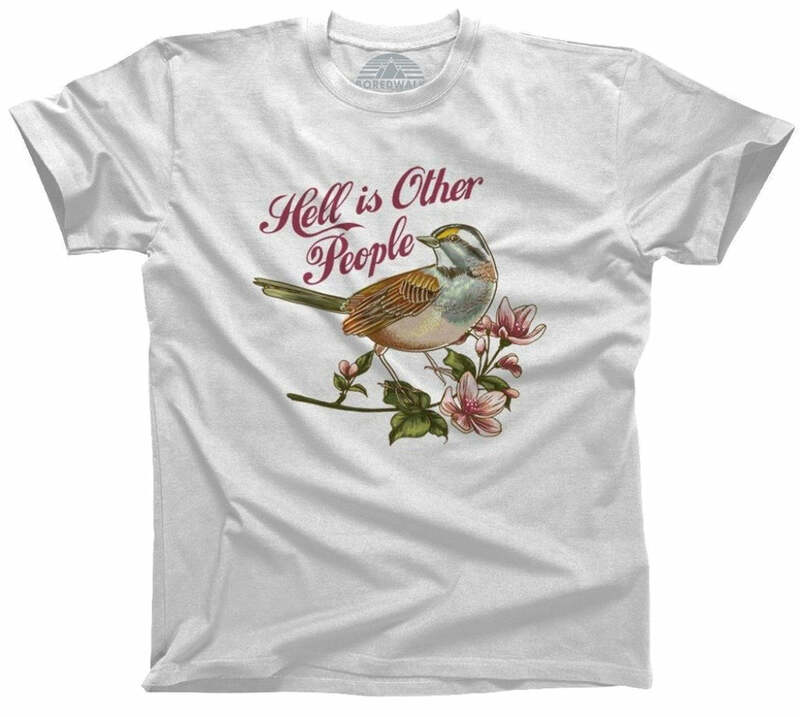 Makes a great gift for your favorite loner or friend with social anxiety. Perfect for staying in with your cat or dog, who will no doubt be impressed with your excellent taste. Also, we know we are going to get about a zillion comments informing us that anti-social and asocial are two different things and that asocial is more correct. In the psychology profession this is true, but in the common parlance anti-social has come to mean how it's being used in this context. Language evolves and Merriam Webster is on board, so please don't email us to complain about this :) You're not telling us something we aren't aware of. I wear this to work. Tired of dressing up and trying to **** my gut in for my 3rd shift job. I wear this to work now, instead, and it really gives me that 'back the f**k off' vibe I'm looking for. Also, it's comfy. First, delivery was very fast! Second (and most importantly) I absolutely adore this shirt! It's soft and a good quality. I ordered this shirt in white. The print has a kinda vintage/worn look which can be seen in the photos. I've washed it twice and didn't see any immediate fading or cracking of the print. I ordered a mens/2X and was very pleased with the length which, on me, was a little longer and reached my hips. Would definitely reccomend the shirt and Boredwalk. It was a huge success. The recipient loved it, the material was very soft, the sizing was true it arrived on time. I'm a fan. I love this shirt and it’s very soft and comfy with a great fit. Keep up the great work!